OpenCulture.com describes itself as the home of “the best free cultural & educational media on the web.” If you are a lifelong learner or an aspiring polymath, this site certainly holds a treasure trove of delights. Whether you are looking for free online courses, language lessons or business courses, this site has something that will pique your interest. Bookmark this one; there’s so much to explore! 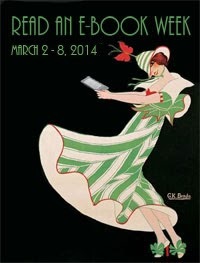 From March 2 – 8, once again, we are celebrating Read an E-Book Week! To promote and encourage the reading of e-books, there are a plethora of free and discounted books to choose from. This year, Smashwords is acting as the hub for the week-long promotion. Participating authors are offing discounts that range from 25% to 100% off the usual purchase price of the book. Smashwords offers all of their titles in a variety of formats for the various e-readers and apps, including Epub, mobi, PDF, text and online versions. The Smashwords pages also has links to other retailers who are having special promotions for the week, including Apple, Barnes and Noble and the Diesel Book store. If you are aware of any other retailers and online e-book stores celebrating with sales and discounts, please leave a link in the comments!